The last Golden Oldies look at EMI’s new Icon Series dealt with reissue boxes of some of the past century’s great instrumentalists. Now it’s time to look at the singers in the series, and they’re a formidable group, representative of some of the finest to tread the opera and concert stages of the second half of the 20th century. Some of EMI’s greatest aren’t included in this first release of singers but I’d be surprised — and disappointed — if the next release doesn’t include Tebaldi, Corelli and Gedda, among many others (EMI has already sliced and diced their Callas catalogue to excess, though on past performance I’d bet she eventually gets an Icon box too). But what we have here are five Icon boxes that deliver many hours of great vocalism. As is increasingly — and depressingly — common these days, no texts and translations are offered in the accompanying booklets. That’s marginally excusable for familiar arias, but downright criminal when it comes to unfamiliar material or to song and lieder selections. After all, those texts and translations exist; they were included in previous editions of this reissued material. No big bucks are involved, just some more pages in the booklets. At Icon’s modest prices another dollar or two per box to cover the cost of adding them would hardly deter buyers. Like older, less than state-of-the-art transfers, the absence of texts and translations is one of my pet peeves. Now that it’s off my chest let’s turn to the glorious singing. Well, if there’s anything certain in this world it is that promises will be broken. So I have to revive my pet peeve about missing texts and translations, not so much about standard opera arias, but about songs. The Jussi Björling box makes the point. An earlier EMI set of the great tenor’s studio recordings did offer at least the texts and translations of his Swedish songs. This new set doesn’t even do that. So unless you’re a Swede, good luck trying to figure out what Jussi’s singing about. It’s all the more galling because, unless you’ve got the contents of the set in previous editions, getting this one is a no-brainer. He had a voice that was immediately recognizable, a light tenor in his early years that darkened over the course of his career. Not a touch of Nordic coldness intruded in his Italian arias, and a tinge of sadness in his timbre enriched his interpretive depth. The set covers his recorded output from 1929, at age 18, to 1959, the year he died, still shy of his 50th birthday. Virtually everything here illustrates Björling’s near-perfect union of vocal beauty, elegance and style. The material from the 1930s finds him in his freshest voice, heartbreakingly pure of tone. The gems from that period include one of the greatest of all tenor recordings, Offenbach’s “Au mont Ida” from La Belle Hélène, from 1938. His late 1930s Verdi recordings, including “Celeste Aida,” and the “Ingemisco” from the Requiem, are icons in themselves, vocally exciting without the vulgar touches commonly imposed on the music. 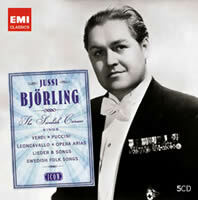 Björling’s Swedish songs and his renditions of Beethoven’s “Adelaide” and Strauss’ “Morgen,” not to mention such encore items as Stephen Foster’s “Jeannie with the Light Brown Hair” hold similar iconic status, and the last disc in the set, with arias from Pagliacci, La bohème and Madama Butterfly, drawn from his complete 1950s opera sets, are icing on the cake. If you listen attentively to the more than six hours of vocal gold on these five discs, you’re bound to find dozens of other selections that challenge even those exemplars of immortal singing. Giuseppe Di Stefano was another tenor blessed with a voice that could move the hardest of hearts. 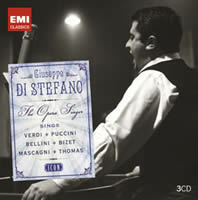 For a while, early in his career, Di Stefano sounded like a reincarnation of Tito Schipa with a touch of squillo added, but the voice thickened through harsh usage in verismo roles and by the mid-1960s he was in audible decline. Fortunately, this three-disc set presents him in his glory years, recordings made between 1947 and 1957, the latter year’s aria from Otello an indication of his ill-advised move to heavier roles. Today, he’s probably best known for his series of opera sets made with Maria Callas, and the 1953-54 excerpts from Bellini’s I Puritani, Puccini’s Tosca and Verdi’s Rigoletto and Il Trovatore are obvious highlights. 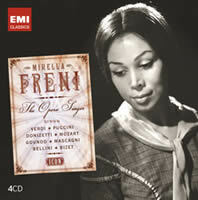 But vast pleasures also await from the pure-voiced early aria recordings from 1947 to the Sicilian songs. Opera buffs will want this but it’s not a set like the Björling box that leaves you unable to push your player’s Off button. I know it’s something of a stretch, but I sometimes think of Janet Baker as the female equivalent of Jussi Björling in her distinctive, immediately recognizable timbre, tinged with a touch of sadness, and her interpretations, always bringing texts to life, never exaggerating or vulgarizing to give cheap thrills to the gallery. At first she bore the label of contralto, which changed to mezzo when that classification largely subsumed the deeper-voiced category. Her plush voice moved easily into the upper ranges, though, sometimes sounding like a soprano with an unusually strong bottom register. This five-disc Icon set is like a box of highlights of her career, with the usual suspects included because it would be absurd not to — Brahms’ Alto Rhapsody and Wagner’s Wesendonck-Lieder with Boult, Elgar’s Sea Pictures and Berlioz’s Les Nuits d’été with Barbirolli, and a full disc of Mahler song cycles including an unforgettable Kindertotenlieder among much more. There’s also a sampling of her wonderful Strauss lieder, Schubert and Schumann songs, including the latter’s Frauenliebe und leben, all done to a perfection that doesn’t lend itself to picking one title or another as special — they all are. But any selection from Baker’s vast discography, even one as generous as this one, is bound to leave me frustrated — why this Schubert song, not that one; why not more of her English songs, examples of her Handel operas, and where are the arias from the Klemperer St. Matthew Passion, etc., etc.? 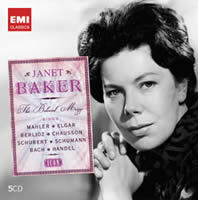 When I hear great singers I get greedy; I want it all, so next time EMI gets around to churning out a Janet Baker reissue, here’s hoping it’s one of those monster editions, with full notes, texts and translations. Unless you’ve got everything in this box, it’s a mandatory purchase. Victoria de los Angeles was the most beloved soprano of the second half of the 20th century. Everybody loved her. Singing during the period when opera lovers were divided into rival camps whose allegiances were devoted to Tebaldi and Callas, she was one of the few who could bridge the gap and get respect, and even love, from both groups. 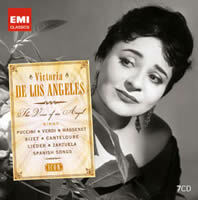 This seven-disc Icon set covers her glorious prime with arias and songs recorded between 1953 and 1969 though it largely duplicates a pair of early 1990s four-disc boxes, respectively titled The Fabulous Victoria de los Angeles and Songs of Spain. Those long out-of-print boxes, by the way, supplied full texts and translations, but apparently they’re not deemed essential in the 21st century. The voice throughout this set is fresh, warm and communicative, without idiosyncrasies of interpretation but very much with a directness that can be said to go from the heart of the singer to the heart of the listener. Much of that magic is captured here, especially in the Spanish songs and Zarzuela arias, but also in lied by Schubert, Schumann and Brahms and in the French songs, where you won’t find much of the necessary earthiness in Cantaloube’s Songs of the Auvergne, but you will find delight and creamy-smooth vocalism. The opera arias are terrific as well, covering the gamut from Wagner, Verdi and Mozart to her famous Carmen and Mimi in Puccini’s La bohème, both with Beecham. And has the Aria from Villa-Lobos’ Bachianas brasileiras No. 5 ever sounded as delicious as it does here under the composer’s direction? Mirella Freni was another charmer, a lyric soprano whose tonal warmth and air of vulnerability made her everybody’s favorite Micaela in Carmen and the leading exponent of such Puccini heroines as Mimi and Madama Butterfly. In mid-career, at the behest of von Karajan, she took on heavier Verdi roles like Aida with honorable, if not ideal, artistic results. She may have lacked the sheer vocal size others brought to such roles, but she made up for it with her acute sense of style and phrasing, and her refusal to push her voice beyond its natural limits. These four well-packed discs cover her career from 1962 to 1986 in a wide variety of operatic roles, including duets and scenes with the likes of Gedda, Carreras, Vanzo, Corelli and Vickers, among others. Her limpid timbre adds to the appeal of the bel canto and Mozart selections and the French repertory. But she’ll probably be best remembered for her Puccini heroines and this Icon set includes eleven selections from seven of his operas, all done with perfection in style and vocalism. Freni not only conveyed the vulnerability of Puccini’s heroines but had the requisite style and phrasing down pat while also letting her voice bloom to fill out the climaxes without ever sounding strained or pressured.